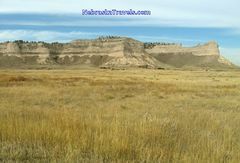 If your Western Nebraska Panhandle or Sandhills Nebraska Travels take you near Scottsbluff, Nebraska, this is our listing of the "Should See's" and "Must See's" in the Scottsbluff area - complete with directions to the Sites and links to more information + often pictures and maps at the web sites for the attractions. The Popular Scotts Bluff National Monument Site and Visitor Center is about 5 miles SW of Scottsbluff on Hwy 92 about 2 miles west of Gering, NE. The Historic Scottsbluff National Monument Site on the Oregon trail includes the very visible rock formations that rise 800 feet above the surrounding area and the nearby North Platte River. There is a paved winding road that you can drive from the Park Visitor Center up to the top of Scotts Bluff National Monument. Don't miss the panaroma views of the valley and nearby town of Scottsbluff NE + a view of Chimney Rock in the distance to the east. There are hiking trails at the top plus a 1.6 mile trail up to the top from the Park Visitor Center. Check out the National Park Service comprehensive web site on the Scotts Bluff National Monument with history and science links, plus a helpful "plan your visit" link including a map and visitor center Information with hours and fees. Click this link for Geologic information + some great pictures of the Site. The Scottsbluff National Monument Site is a definate Scottsbluff NE area "Must See"
Wildcat Hills State Recreation Area and Nature Center - 8 mi. 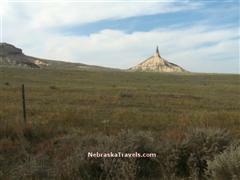 S. of Gering on NE Hwy 71 - Rugged and beautiful country - has great hicking trails + picnic facilities. Great for backpackers. 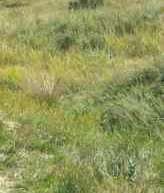 Includes a game reserve with buffalo and elk. This Link goes to the Wildcat Hills State Recreation Are + Nature-Visitor Center page on the Nebraska Game and Parks Web Site. On the way down to Wildcat Hills State Recreation Area, don't miss the very scenic 23-mile gravel driving "Road to Robidoux Pass." The westbound Oregon Trail traffic went through this pass. The drive starts out 1 mile south of Gering on Hwy 71 and goes west 8 miles on the gravel Robidoux Road. You will go by the reconstructed Robidoux Trading Post - follow the signs to Summit Ranch Road and then Carter Canyon Road back east to Hwy 71 - road comes back to Hwy 71 a few miles north of Wildcat Hills State Recreation Area. Tip Enlarge new viewing window to full size to see Map Image and text full size so can read easier. See an Intereactive map showing the marked Robidoux Pass road and other marked roads on the Robidoux Pass Driving Road + the general area immediately south of Scottsbluff, NE and the Scottsbluff National Monument. Tip - Open in a full window to see all of the map -- can use Map move arrows or right click and "grab" and drag map to see Wildcat Hills Recreation Area below (to South) about 6 miles on Hwy 71. Drag Map to lower right to see Scottsbluff area and Scottsbluff National Monument. The Wildcat Hills State Recreation Area and driving road to Robidoux Pass is a definate Scottsbluff, NE area "Must See"
The Chimney Rock National Historic Site and Visitors Center is about 5 miles SE of Jct of Nebraska Hwy 92 & US Hwy 26 near Bayard, NE --approximately 25 miles SE of Scottsbluff on Hwy 92. The popular Historic Chimney Rock Attraction is visible from some distance - the most recognized landmark on the Oregon Trail. The spire of Chimney Rock was measured at about 500 feet above the river in 1890. It is estimated that a total of about 30 feet have been lost to a 1992 lightning hit that knocked off 4 feet plus the effects of weather over the last 110+ years. 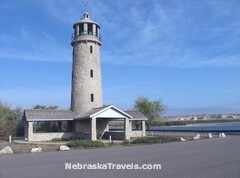 Lake Minatare State Recreation Area and Lighthouse - About 7 miles NE of Scottsbluff, NE - 9 mi. north of town of Minatare on Stonegate Rd. Lake Minitare is a State Recreation Area with more than 2,000 acres of water. There were several fisherman out in boats the last time we were there and it looked like the fishing was good. Camping, picnicking, and swimming are also available. If you enjoy Historic Lighthouses and Scenic Lakes, the Lake Minatare Lighthouse and Lake Minatare Recreation Area are a "Must See" - We found it a great place to eat a peaceful picnic lunch at a scenic spot overlooking the lake. Agate Fossil Beds National Monument - about 32 miles north of Scottsbluff, NE on Hwy 29. 24 mi. S. of Harrison, NE on the way north up to the Crawford and Chadron area. The Visitors Center and Museum displays many fossils of ancient animals and American Indian artifacts from 31 Native American tribes. The internationally recognized Agate Fossil Bed Site contains a very narrow Niobrara "stream" area not too far from the point of origin of the Niobrara river + some interesting walking trails among the quarries. American Indian artists show their art on some weekends during the summer months. This link goes to an Agate Fossil Beds National Monument "Plan Your Visit" page on the National Park Service Web Site with a Map + links to the Agate Fossil Beds Visitors Center and Museum activities dates and hours open + fees. See many pictures and more Geology fieldnotes information on this Explore Geology - Nature and Science section of the NPS web site. If you are interested in the recovery process for ancient fossils and viewing Indian Artifacts, the Agate Fossil Beds National Monument Site is a "Must See" for travel in either the Scottsfluff, Nebraska or the Chadron, NE area. Read Candid User Reviews and Ratings + compare prices of Scottsbluff area Hotels and Motels at this page. Compare prices and ratings + read what other travelers have to say at TripAdvisor for Scottsbluff, NE. A listing of some of the pages on this Nebraska Travels Site now, plus some of the pages and pictures to come are in the Menu listing to the left. More are being added as we think of additions that would be interesting to our Site visitors -- especially topics that we currently have pictures for since this is a "picture enhanced" Site. We took over a thousand pictures + a few videos from our last road trip vacation through the Nebraska Sandhills and the Western Nebraska Panhandle, so we have a few pictures to choose from. The list of the pages here now + descriptions is below. To a Scottsbluff Nebraska Map with the local area Attractions labeled and briefly described. A very handy printable Scottsbluff, NE map. Sandhill Crane Migration - Pictures & Updated Viewing Location Tips, + Video of thousands of Cranes flying in to roost for the night on the Platte River at Sunset and their unusual sounds! Come back and watch our growth -- and check for our our new Nebraska Sandhills, Scottsbluff NE, and other Nebraska Travels Attraction pictures and video clip postings! -- easy to remember to come back to any of our US Vacation Sites! Info on your next Affordable Nebraska Travels -- or to check out our latest Picture and Video additions! Gene - Contact Us - send your comments or suggestions -- or share your own Scottsbluff NE Travels and Nebraska Sandhills or Panhandle favorites or pictures. We appreciate your comments and feedback! Looking for something specific? Search our 3 US Vacation Guide Sites.